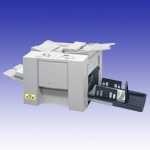 The RISO i Quality systemTM offers a large number of quality and conveniencebenefits. – Automatic assurance of optimum print quality. – Prevention of operator error. – Warning of shortages in remaining ink/master volume. with the RISO i Quality System. Specifications are subject to change without notice. Details may vary depending on the region. *1: Use a commercially available USB cable less than 3m (that conforms to the USB 2.0 standard).